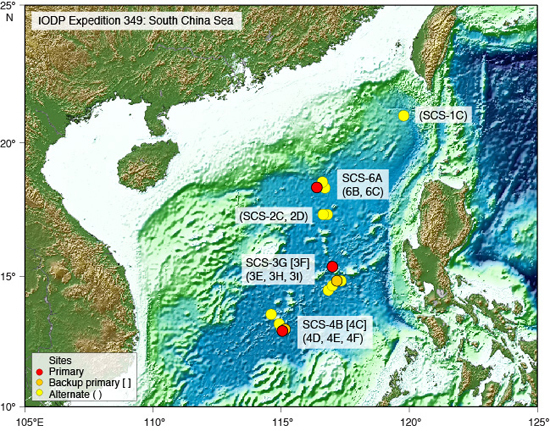 This expedition, based on IODP Proposal 735-CPP2, addresses the history and mechanisms of opening of the South China Sea (SCS), and its implications for East Asian and western Pacific tectonic and paleoenvironmental evolution. This will be achieved by coring through the sediment and into the oceanic basalts at four different subbasins, with total penetrations ranging from 0.7 to 1.9 km in 3.3 to 4.4 km water depths, to determine the breakup and basin formation history since the late Mesozoic. Geochemical sampling of basement rocks at different ages within different magnetic zones and around key tectonic events will provide critical information on how the crust and mantle evolve at various stages of basin evolution. Scientific objectives are to (1) establish the complex opening history of different subbasins and styles of oceanic crustal accretion of the SCS; (2) test various hypotheses of dynamic processes controlling transitions from a Mesozoic active continental margin to a Cenozoic passive one, and constrain whether the forces driving the opening of the SCS were far-field, near-field, or in-situ; (3) reveal the crustal nature and affinities of different subbasins, and understand oceanic crustal and deep mantle processes associated with tectonic extrusion, magmatism, and magnetization; (4) develop a complete 3D sedimentation and subsidence model and link it to regional climatic processes in response to various tectonic events; and (5) integrate these results to add to our general understanding of the geodynamic interplay of mantle and lithosphere processes that lead to the development of continental margins.